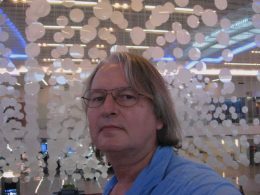 Bruce Sterling, author, journalist, editor, and critic, was born in 1954. Best known for his ten science fiction novels, he also writes short stories, book reviews, design criticism, opinion columns, and introductions for books ranging from Ernst Juenger to Jules Verne. His nonfiction works include THE HACKER CRACKDOWN: LAW AND DISORDER ON THE ELECTRONIC FRONTIER (1992), TOMORROW NOW: ENVISIONING THE NEXT FIFTY YEARS (2003) and THE EPIC STRUGGLE OF THE INTERNET OF THINGS (2014). During 2005, he was the "Visionary in Residence" at Art Center College of Design in Pasadena. In 2008 he was the Guest Curator for the Share Festival of Digital Art and Culture in Torino, Italy, and the Visionary in Residence at the Sandberg Instituut in Amsterdam. In 2011 he returned to Art Center as "Visionary in Residence" to run a special project on Augmented Reality. In 2013, he was the Visionary in Residence at the Center for Science and the Imagination at Arizona State University. In 2015 he was the Curator of the "Casa Jasmina" project at the Torino Fab Lab. In 2016 he was Visionary in Residence at the Arthur C. Clarke Center for Human Imagination.